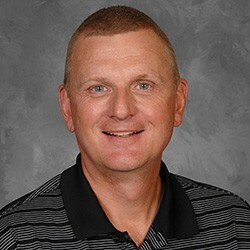 Mr. Doug Snyder is a 22-year educator and has been a member of the teaching staff at Chardon High School for 15 years. He is the athletic director at Chardon High School and was engaged in a 911 call from the C.H.S. main office for more than 13 minutes in the immediate aftermath of the Chardon High School shootings on February 27, 2012. He also assisted first responders in their initial entrance into the school. The school shooting at Chardon left three students dead and three others injured. Mr. Snyder teaches two classes of English at Chardon High School, also serving as Athletic Director and Head Boys Basketball Coach. He is a firm believer in the unifying power of high school sports, and he was actively involved in the organization of the Chardon Crazies, the highly-renowned student cheering section at Chardon High School that is credited with the beginning of the healing process for Chardon students in the week following the shootings. Mr. Snyder received Bachelor of Arts in Communication and Master of Arts in Teaching degrees from Kent State University. He and his wife Betsy live in Chardon with their son Cooper, a junior at Chardon High School.